$24,671 will buy you a new 2015 Subaru Cross-Trek, pay for a one-bedroom apartment in Washington, DC, for a year, or buy a health plan for a family of four covered by an employer in the U.S.
That number is this year’s Milliman Medical Index, calculating the average company’s cost to cover a family in a preferred provider organization (PPO) in 2015. Milliman, the actuarial firm, expects the cost increase from 2014 will be 6.3% — up from the growth rates seen in 2013 and 2014. Underneath that $24,671, Milliman notes that employees, the covered worker and their family, pays for about 42% of the total. This includes the premium share and out-of-pocket medical costs at the point of care, around $10,500. Based on the median family income in the U.S. in 2013 (the latest year reported by the U.S. Census Bureau), health care costs consume about 20% of gross household earnings. This is consistent with the U.S. Commerce Department’s estimate that the average U.S. family spends one-fifth of income on health care. In the first quarter of 2015, 22% of household spending in America went to health, illustrated by the upward-trending line chart in the graph. But that’s not the whole story on Americans’ spending for health. That $1 in $5 only covers the statistic for healthcare costs, which add up to $3.2 trillion of the U.S. gross domestic product (GDP). U.S. consumers spend another $1.5 trillion on products and services they value to bolster personal health: vitamins and supplements, gym memberships, weight loss programs, health-enriched foods (known as nutraceuticals), alternative medicine practitioners like chiropractors, and other out-of-pocket outlays. These dollars are largely 100% out-of-pocket and not eligible for tax-benefited health savings accounts (HSAs). U.S. consumers therefore bear even greater health/care costs than the Commerce Department captures in their health spending line item. While employers have increasingly offered high-deductible health plans in the past several years to help companies mitigate health cost increases and, enrollment in high-deductible health plans has dramatically increased since the implementation of the Affordable Care Act (ACA) in 2013. The good news signalling one form of success for the ACA is that over 16 million uninsured people have enrolled in health plans in the Act’s first two years. The 35% reduction in the uninsured population is a positive outcome for the law. However, the “Affordable” adjective in the legislation’s name has been elusive for many newcomers to health insurance, especially people who have signed up for individual (as opposed to group) health plans. Consumers who signed up for health insurance on an individual basis versus being part of a group insurance plan are more likely to have a higher deductible than insureds in group plans. If the deductible is at least 5% of household income. The bottom-line in the report is that some 31 million adults are underinsured in 2015, about the same number that were underinsured in 2010. The Commonwealth Fund found that one-half of underinsured people had at least one medical bill problem or debt – the same rate as people who were uninsured – and more than twice as likely to have medical bill problems as people who were not underinsured. As a result, people who were underinsured experienced financial problems due to medical bills, such as receiving a lower credit rating, and using up savings, experienced by nearly one-half of underinsured people. In addition, one-third of underinsured people took on credit card debt due to medical bills. Finally, 44% of underinsured people – although having the benefit of health insurance – had problems getting needed care because of cost, including having a medical problem but not going to a doctor for a visit; not filling a prescription; skipping a medical test or treatment that were recommended by a doctor; and, not seeing a specialist when recommended to do so by a physician. Families USA published a report in May 2015, based on Urban Institute research, on Non-Group Health Insurance: Many Insured Americans with High Out-of-Pocket Costs Forgo Needed Health Care. This research reinforces The Commonwealth Fund’s findings that consumers purchasing non-group health coverage are more at-risk for being underinsured. 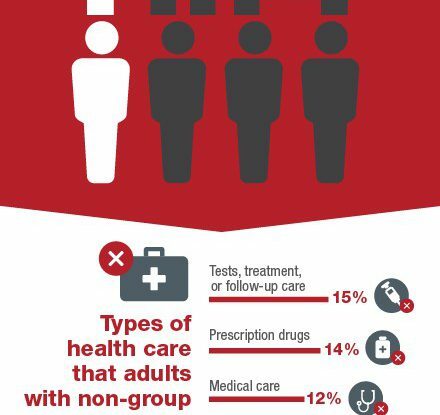 One in four adults in non-group plans opted to not receive health care services due to costs. In the post-ACA era, we can now point to a personal financial risk that is gaining steam: having inadequate health insurance.